Be the first to share your favorite memory, photo or story of Virgie. This memorial page is dedicated for family, friends and future generations to celebrate the life of their loved one. 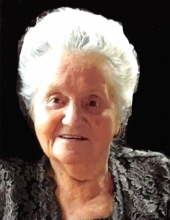 Virgie (Andrew) Parrett was born June 11, 1927, in Jackson County, KY, and departed this life Monday, January 21, 2019, at The Terrace Nursing & Rehabilitation Facility in Berea, KY, being 91 years of age. She was the daughter of the late Oscar & Lucy (Whicker) Andrew. Virgie is survived by her loving husband, David Parrett, of Berea, and by three children: David D. Parrett and his wife, Marilyn, of Louisville, KY; Tonita Cornett and her husband, Manton, of Berea; and Jennifer Smith and her husband, Russell, of Hamilton, OH. She is also survived by three siblings, her twin brother, Virgil Andrew and his wife, Eula, of McKee, KY; Bruce Andrew and his wife, Henrietta, of Berea; and Don Andrew and his wife, Olga, of Berea. Virgie was blessed with two grandsons, Jonathan Parrett of Chicago, IL, and Zachary Parrett of Detroit, MI, and by a host of nieces and nephews. In addition to her parents, Virgie was also preceded in death by the following siblings: Albert Andrew, Arnold Andrew, Ray Andrew, Rudy Andrew, Alma Becknell, Lola Cook and infant siblings, Verla, Beulah, Nola & Denny and by her son in law, Roland Goodwin. Virgie was a member of the New Hope Holiness Church in Mt. Vernon, KY.
Asa Flat Rd Annville 40402 Ky.
"Email Address" would like to share the life celebration of Virgie Parrett. Click on the "link" to go to share a favorite memory or leave a condolence message for the family.